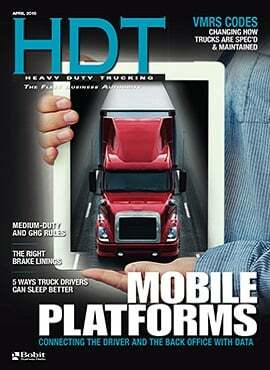 The trucking industry is undergoing profound shifts and changes. In fact, you could argue that we haven’t seen this kind of all-encompassing change since the industry made a wholesale move to diesel power in the late 1940s. But long before that technological revolution took place, trucking’s mission was carved in stone: The load would always go through and arrive on time. It was a mantra that defined all aspects of trucking and led to the distinctly American-style swagger that lingers to this day. Everything in trucking, including vehicle design, was set around the concept of freight getting through, No Matter What. 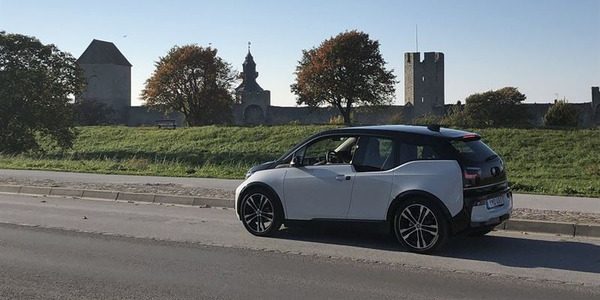 Vehicle design, driver comfort, hours of service and yes, even fuel economy, were all simply means to an end in achieving that overriding goal. It was an article of faith in trucking that one day — far off in the future — fuel prices would rise. They had been doing so for years, in fact. But the process had been slow and almost predictable. The industry watched, aghast, as trucking companies —many small fleets, but also longtime, nationally recognized names — went out of business by the thousands because they couldn’t weather the storm. Today, truck fleets understand that fuel prices can swing wildly with little warning. And the trucking industry itself has undergone a sea change over the past decade: Today, fuel economy is a priority on par with delivering goods in a safe and timely fashion. 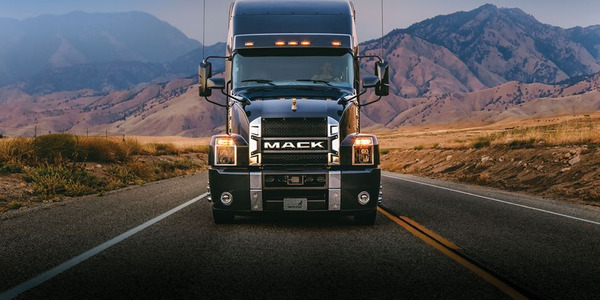 Vehicle and component manufacturers have responded to these new market forces (and more than a little prodding from the government) to create a whole new generation of trucks capable of delivering fuel economy numbers thought impossible just a decade ago. The changes in fuel economy have been so profound that many in the industry wonder if there is any blood left in that turnip. But experts we talked to say yes: There is still plenty of room left in Class 8 vehicle and powertrain design to boost fuel economy performance even more. And many of those changes will be coming your way soon. 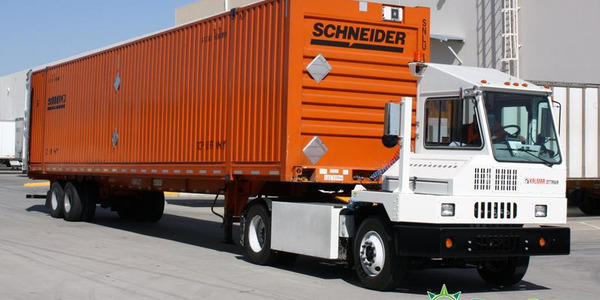 Even with the many changes taking place today, Class 8 truck design has not changed dramatically in the past 20 years. 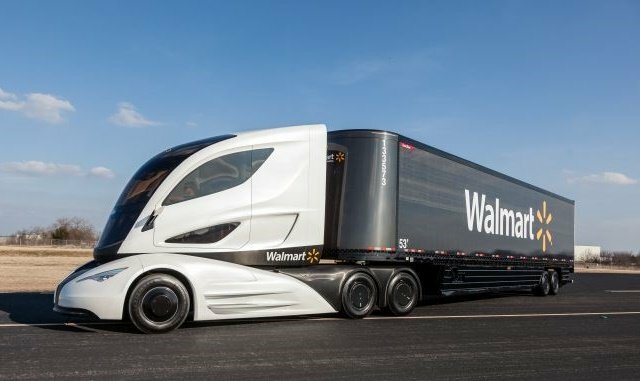 While trucks today are far more aerodynamic, the overall vehicle and powertrain configuration remain pretty much the same and will likely remain so for the foreseeable future. Given those constraints, how beneficial are any upcoming fuel economy enhancement efforts likely to be? Mike Roeth is executive director for the North American Council for Freight Efficiency, a non-profit group that helps fleets evaluate and adopt emerging technology to reduce emissions and boost fuel economy. He says the industry has squeezed so much additional performance out of its designs over the past decade, that it’s only natural to assume there’s little room left for improvement. 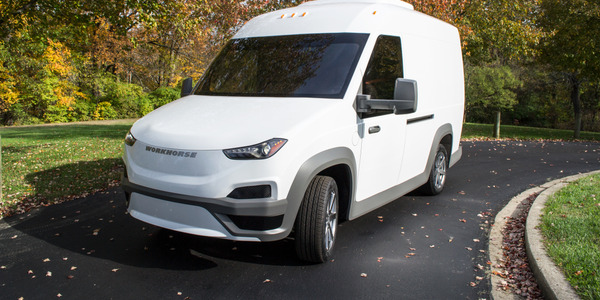 In fact, the commercial-vehicle industry is a blank canvas compared to light vehicles, says Steve Wesolowski, senior director of global advanced engineering for Dana Holding Corp. The Detroit Big Three carmakers are each defining their own strategies on how to integrate connected vehicles to boost fuel efficiency, which leads to limited scope. 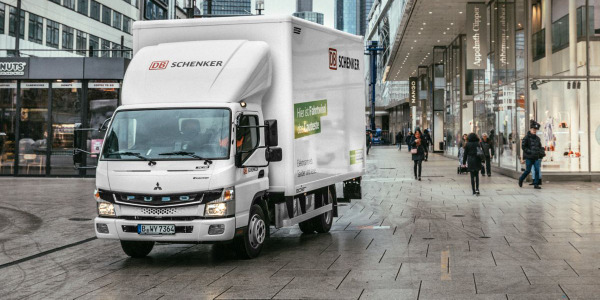 efficiency opportunities to be harnessed, such as disconnect axle technology, which will combine the traction and dependability offered by a 6x4 configuration with the reduced drivetrain losses and improved fuel economy of a 6x2 configuration. Dana is already moving forward with plans to integrate axles featuring this technology into manufacturers’ chassis for field testing. The SuperTruck Program — a joint government-private industry research project to determine the potential for future heavy truck fuel and emissions standards — has provided OEMs and component suppliers with a roadmap to fuel economy standards that would have seemed impossible less than a decade ago. Damon says some of the advanced technologies “harvested” from the SuperTruck project have already found their way onto Peterbilt’s fuel economy-optimized Model 579 Epiq tractor, increasing its fuel economy by up to 14% over a standard-spec Model 579. 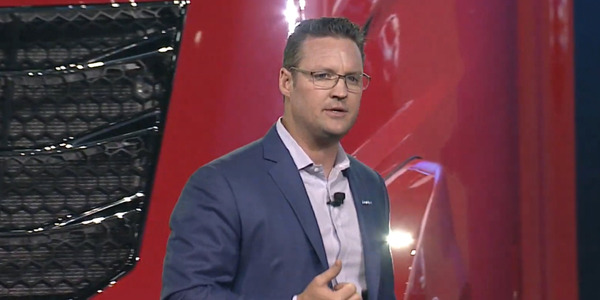 Straight mechanical efficiencies are getting close to the practical limit, but there is definitely energy being wasted in the form of heat or just being used when it doesn’t need to be, adds Kevin Baney, chief engineer for Kenworth. He says new — and even old — powertrain concepts will be applied as vehicle design matures, offering new ways of enhancing vehicle efficiencies. One example he points to are hybrid electric-diesel drivetrains, which will likely find their first viable place in the Class 8 over-the-road market in the form of electrification of engine accessories. The movement to significantly improve truck fuel economy has generated unprecedented cooperation between government and industry here in North America. But it is a true global effort as well. Several truck OEMs are headquartered overseas and faced with a slate of global emissions and fuel economy standards phasing in at different times around the planet. Although the scheduling of these emissions standards is uncoordinated, the end results are very similar. Therefore, it makes sense for companies such as Daimler, Volvo and Paccar (which owns Dutch truck maker DAF), to develop their fuel economy strategies on a global scale. Which means that in trucking today, Europe is very much the go-to place for emerging heavy truck technology. Tony Pain is an engineer retired from DAF Trucks who works with the Centre for Sustainable Road Freight, a U.K.-based nonprofit group with a mission similar to NACFE’s here in North America. Pain says while there is still more to be done in enhancing fuel economy of Class 8 rigs, fuel economy from engine development alone has practical limits. He says major reductions in fuel usage and CO2 must come from a whole series of sources. “Today, it’s really all about carrying more load more efficiently using less fossil-based fuel,” Pain explains. To achieve even that modest increase in efficiency, Pain says trucks will soon rely on increased downspeeding, friction reduction, variable valve timing, downsizing to reduce pumping losses, reducing use of EGR in favor of advanced SCR systems, higher fuel injection pressures with multiple injections, as well as reduced parasitic losses through variable speed oil and water pumps. A bit further out, waste heat recovery systems will turn thermal exhaust energy into practical, on-board, electrical power. Iveco, which makes diesel-powered trucks in Europe, is looking at a host of ways to refine and rethink tractor-trailer fuel economy, from exotic technologies down to simple truck design. Laura Overall, Iveco’s communications director, says currently these efforts include improving the efficiency of air handling systems and engine auxiliaries such as water and oil pumps, reducing friction in the piston group, and even dynamic switching between different combustion types. She says Iveco engineers are also looking at vastly improving tractor- trailer aerodynamics, which can bring about big gains in fuel efficiency. One interesting area Overall points to is the development of intelligent aerodynamics systems, which use variable spoilers that deploy or retract according to vehicle speeds. Perhaps the greatest impact of this technology would be in the trailer gap area. 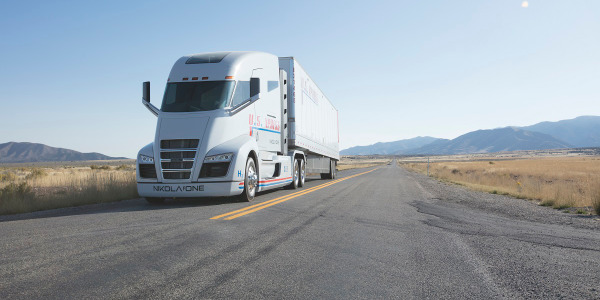 In addition, in the future, variable fifth wheels could draw the tractor and trailer closer together at highway speeds to greatly improve the rig’s fuel economy, then move apart at slower speeds to facilitate steering and maneuvering. 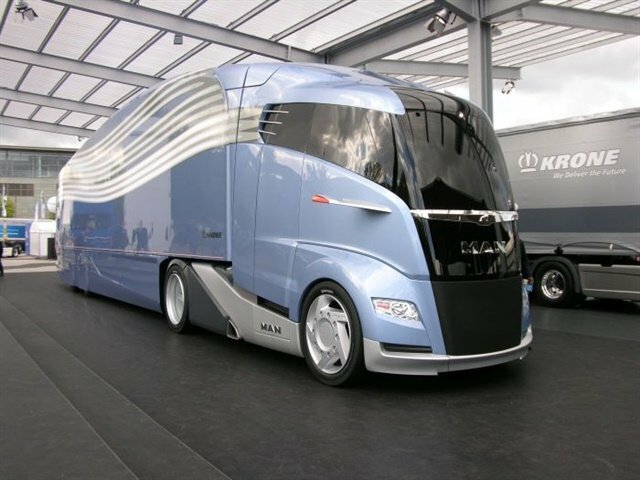 Closer to home, new approaches to aerodynamic design have pushed the familiar boundaries of what a truck is “supposed” to look like while providing a glimpse into future vehicle design. 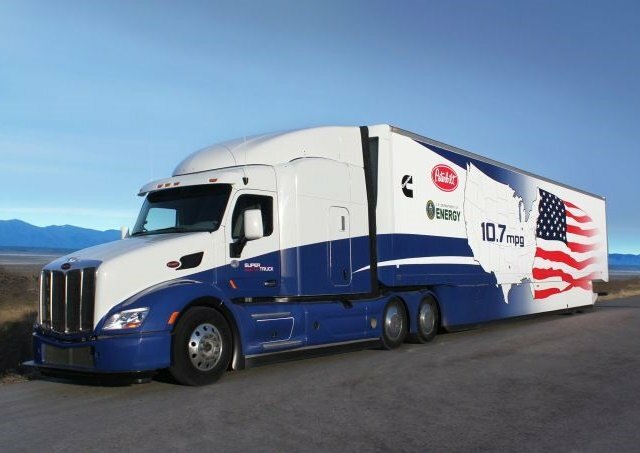 “The Walmart Advanced Vehicle Experience that was exhibited at several trade shows and events last year turned a lot of heads and made a lot of headlines,” says Bill Kahn, principal engineer and manager for advanced concepts for Peterbilt. Kahn says the truck’s futuristic design was a departure from anything the industry had seen before. Moreover, its conception was a new concept: a joint venture between an OEM and leading private fleet — which highlights just how inclusive the effort to boost truck fuel economy has become. 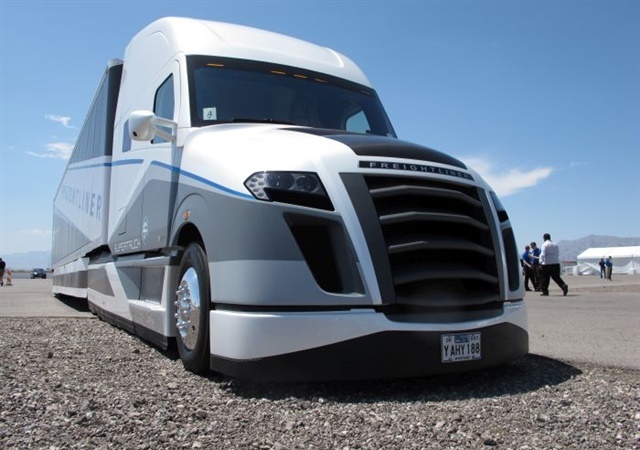 Simultaneously, engineers around the world have been getting creative to identify efficiency gains using more unconventional methods, says Derek Rotz, director of advanced engineering for Daimler Trucks North America. 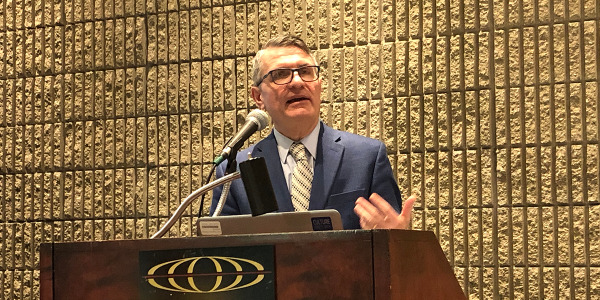 emerging vehicle-to-vehicle (V2V) communication systems, Rotz says combining and integrating these systems to work together is the logical next step as a source for tractor-trailer fuel savings. 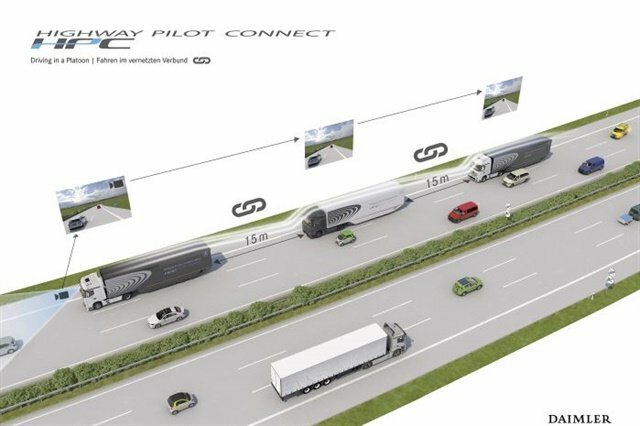 The concept is called platooning and the way it saves fuel is familiar to race fans across the globe: Trucks use V2V communications to fully coordinate their road speeds, braking actions and safety systems in order to safely maintain close following distances. Once electronically tethered together, the trucks can draft with one another in a tight convoy formation, taking advantage of extremely efficient aerodynamics, which can boost overall truck fuel efficiency to a surprising degree. 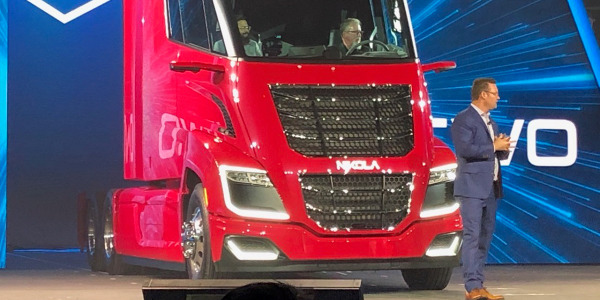 Boyd says Peloton has tested truck platoons with following distances as close as 20 feet between vehicles, although a high-profile demonstration by Daimler outside of Dusseldorf, Germany, earlier this year used intervals of 15 meters, or 40 feet, between trucks. Even at those increased distances, Rotz says in a three-truck platoon, the lead vehicle gets a fuel economy boost of around 3%. The second trailer vehicle gets a 7% fuel economy increase, while the third truck (and any subsequent trucks in a platoon) receive a 9% increase. Platooning may seem far-fetched — and there are many in trucking today who question its safety and effect on drivers — but Rotz, Boyd and other experts point to recent high-profile demonstrations in Europe and say it will likely appear in North America sooner, rather than later. In trucking today, it seems nothing is off the table when it comes to enhancing vehicle fuel efficiencies. Old technologies are being reexamined, while new ones are studied and tested. A new era of ultra-clean, ultra-efficient trucks is just around the corner, likely putting old-style, long-nosed, slab-grilled rigs out to pasture once and for all.